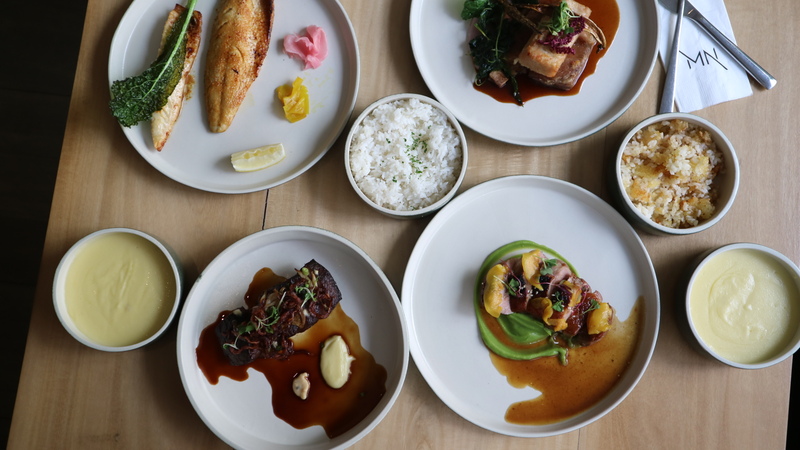 Is it lunch time yet because I have some great news from my favourite German restaurant in Manila. 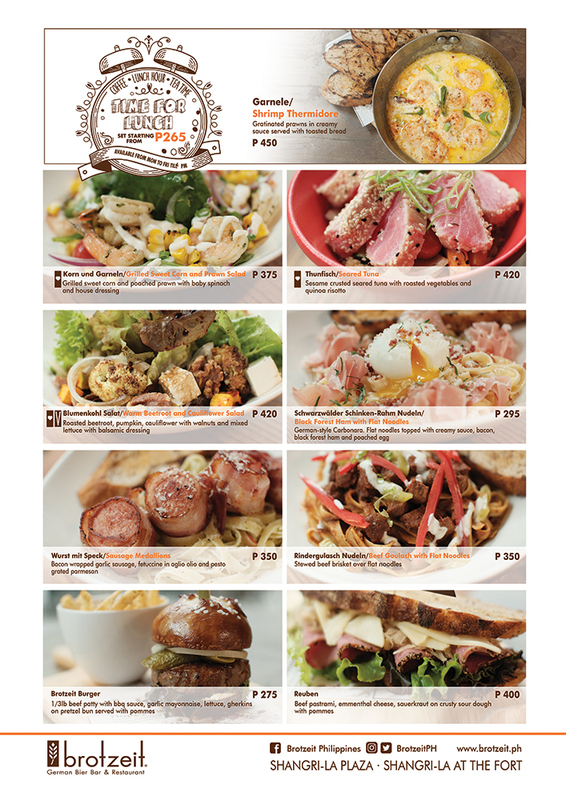 Brotzeit Philippines has a new lunch menu that starts with P265. Here’s a quick list of them. Hungry yet? Lemme try some more convincing by giving my impressions of it from their several dishes. My favourite is thurnfisch or seared tuna. I find it as a perfect meal for health conscious diners like me. 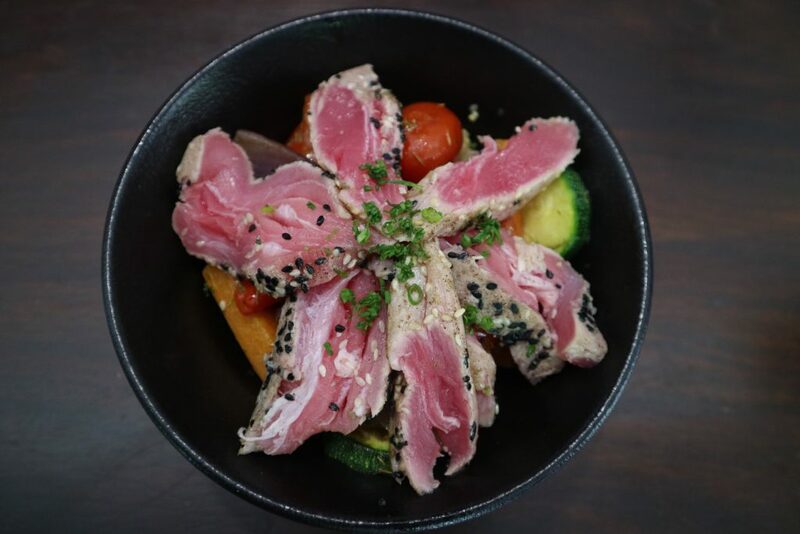 The tuna is seared and encrusted with sesame seeds. It comes with vegetables and quinoa risotto. Korn und Garneln or Grilled sweet corn and prawn salad is a light fare. 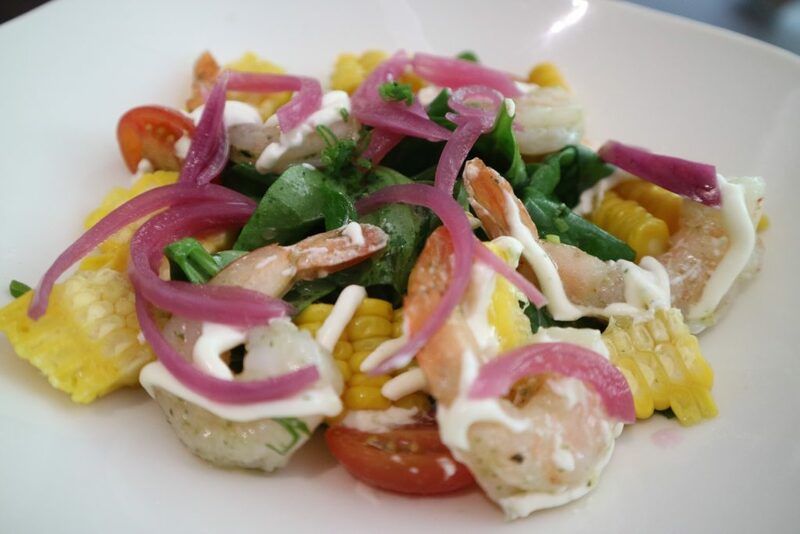 I like how the sweet corn is grilled and the shrimp as poached. It comes with baby spinach and Brotzeit’s house dressing. 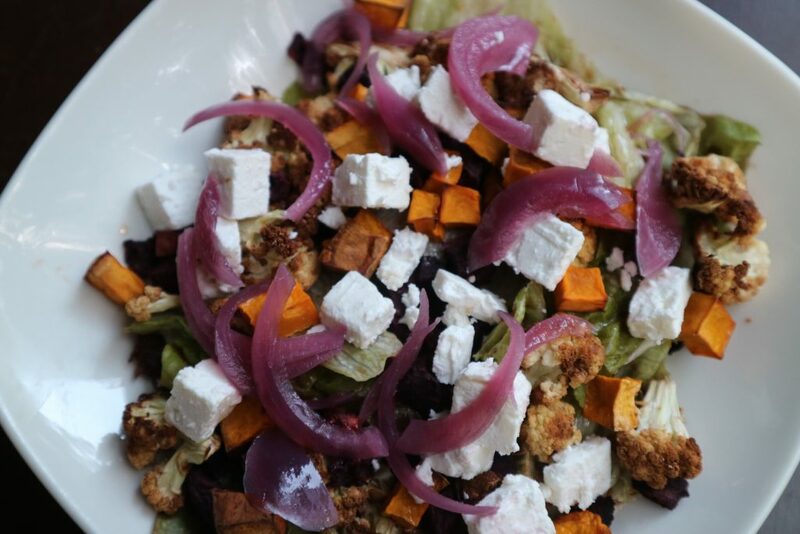 Blumenkohl Salat or warm beetroot and cauliflower salad is also a light and healthy fare. I am so enticed on the roasted beetroot, pumpkin and cauliflower. The spinach and walnuts are additional flavours and it comes with balsamic dressing. For pasta, shwarzwalder Schinken Ruhm Noodeln or black forest ham with flat noodles is my best bet. It’s the German style carbonara. 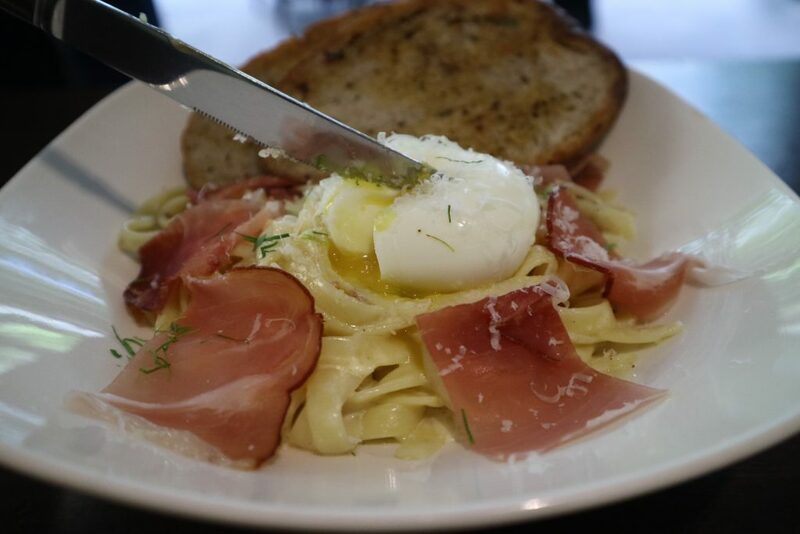 The poach egg is a perfect addition. 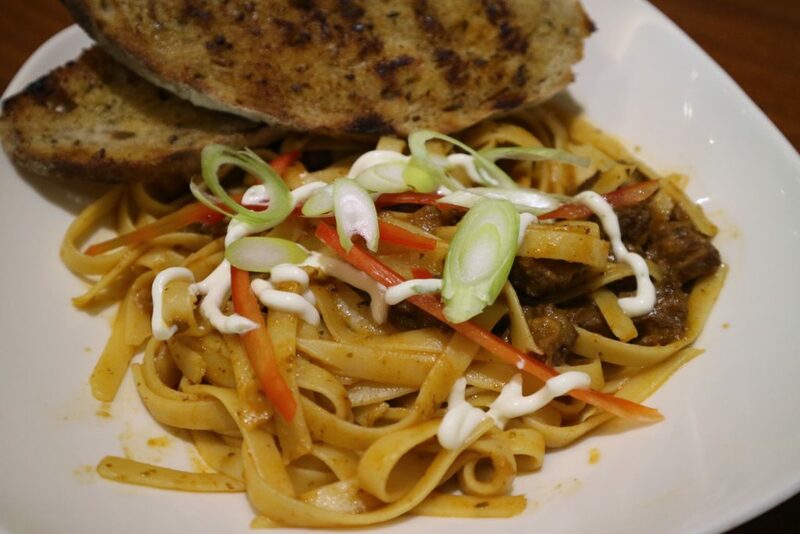 If you are craving for red sauce pasta, rindergulasch nudeln is available. You see it coming. It’s goulasch or stewed beef over flat noodles. 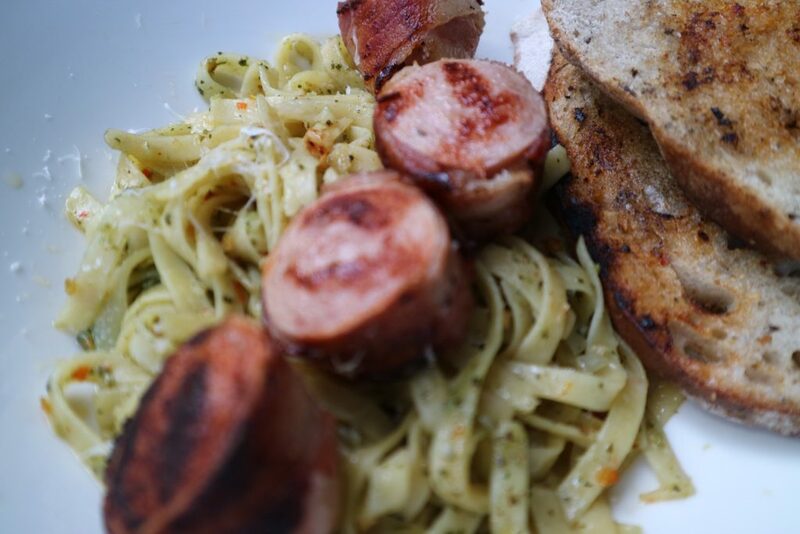 Another delicious pasta they have is the wurst bit speck or sausage medallions. It’s hard not to have a sausage in Brotzeit. Problem solved. 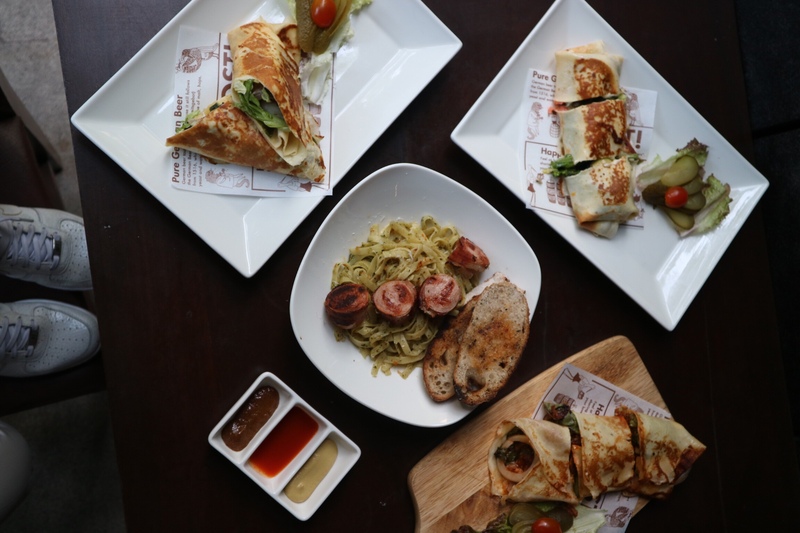 Have it with aglio olio and pesto fetuccini. I also like having crepes for lunch. Brotzeit did not miss on this. They have 3 kinds of crepes served for lunch. 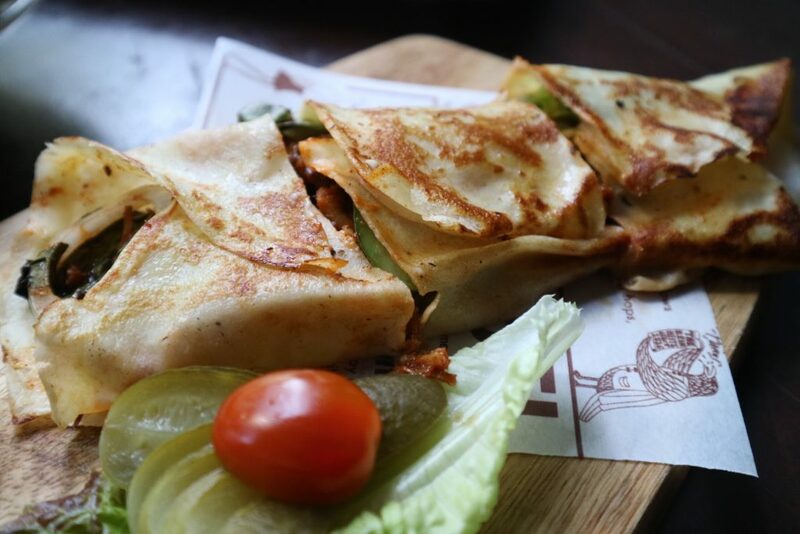 The first is the meeresfruchte kreppe or seafood crepe. Inside it is smoke salmon, tuna, prawns with lettuce and sour cream. 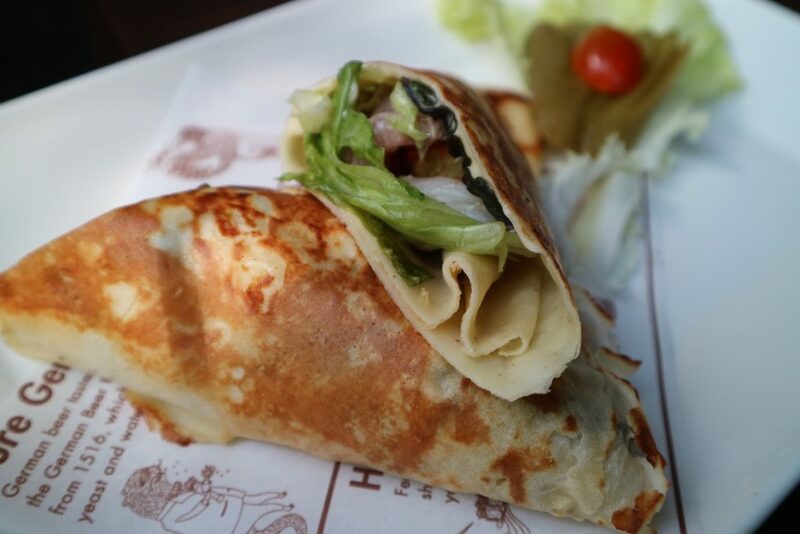 The second crepe is schinken und kase kreppe or smoked ham and cheese crepe. As the name suggests, it has smoked ham and emmenthel cheese in it. It’s quite delicious. Lastly is the gezogenes schweinefleisch krepp or the pulled pork crepe. This is also really delicious as it comes with a BBQ pulled pork. 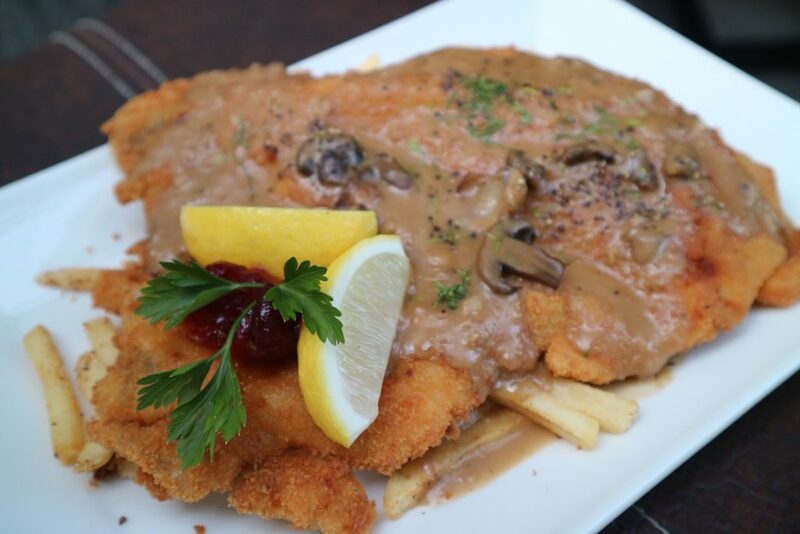 Jagerschnitzel or hunter pro cutlet is a popular dish and also available for lunch. 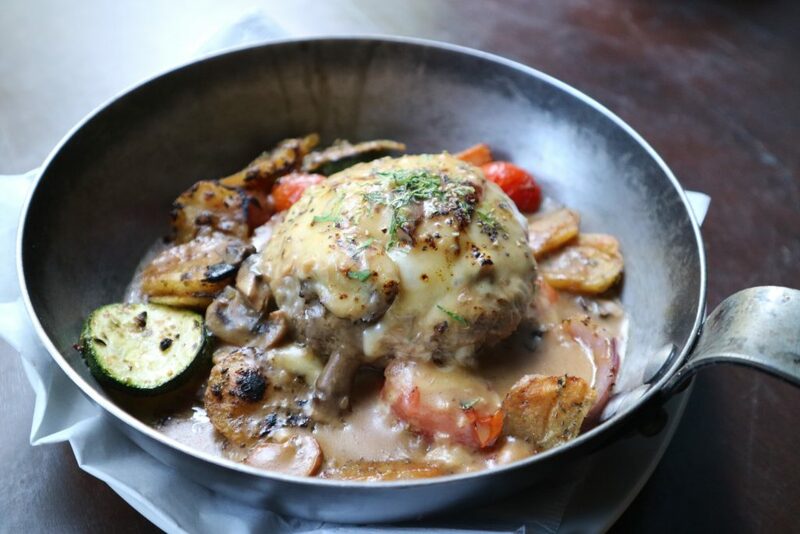 It comes with a breaded pork cutlet with loads of parmesan. 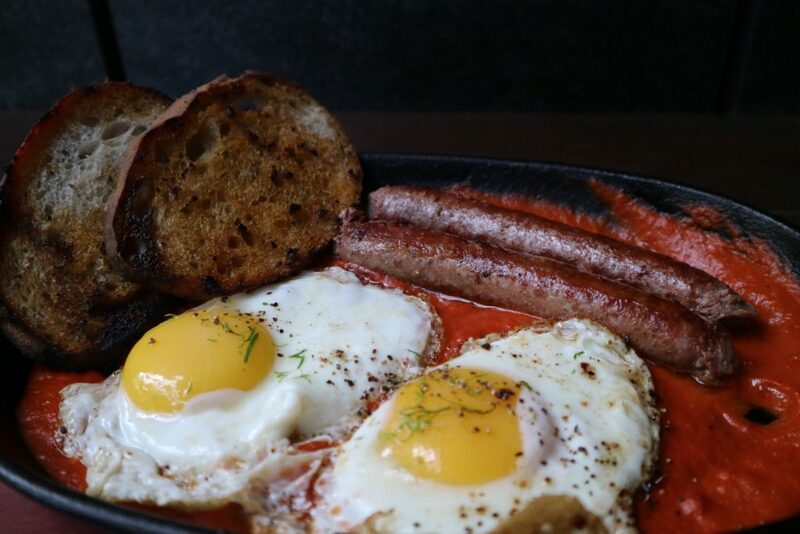 Rostbratwurst or oven baked eggs and sausages is their popular lamb sausage (in or with no casing, ref.:http://dcwcasing.com/). It is served hot in a pan with egg and bread. Fruhstuck or your all day breakfast is always a perfect meal. 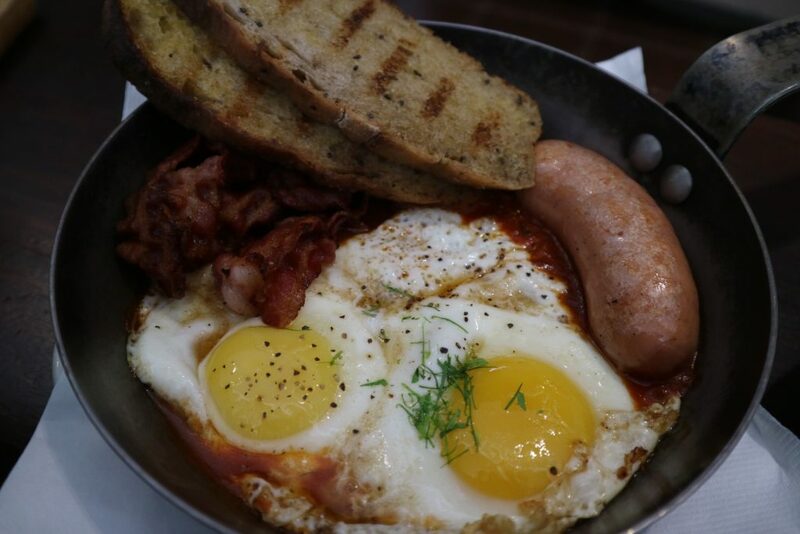 All in one pan is grilled garlic sausage, bavarian beans, super crispy bacon, 2 eggs and bread. Another pan dish is their stewed pork. 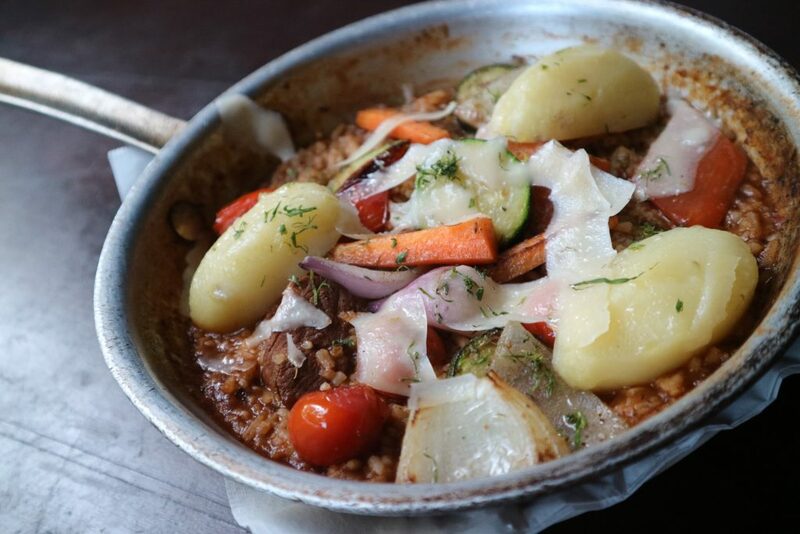 It comes with rice, roasted vegetables and parmesan cheese. 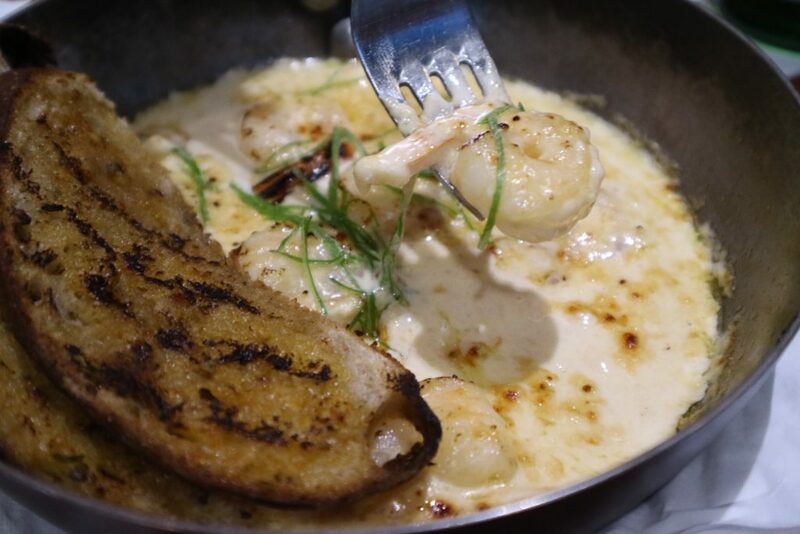 The Garnele or shrimp thermidore is so tasty over a pan of gratinated prawn. Dip your bread into it’s creamy sauce and viola! 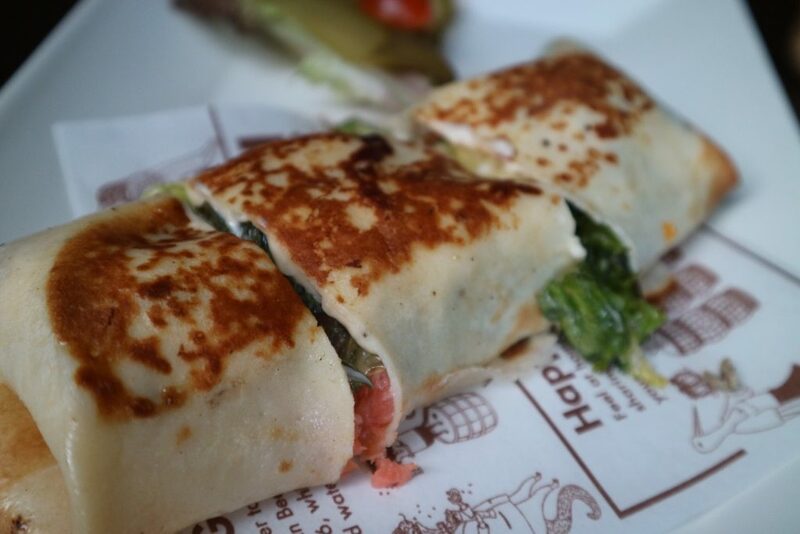 It’s a party in your mouth. If you are craving for beef burger. They have 2 kinds. First is the Gebratenes Hackfleisch or broiled ground beef. It comes with a tasty mushroom gravy sauce. 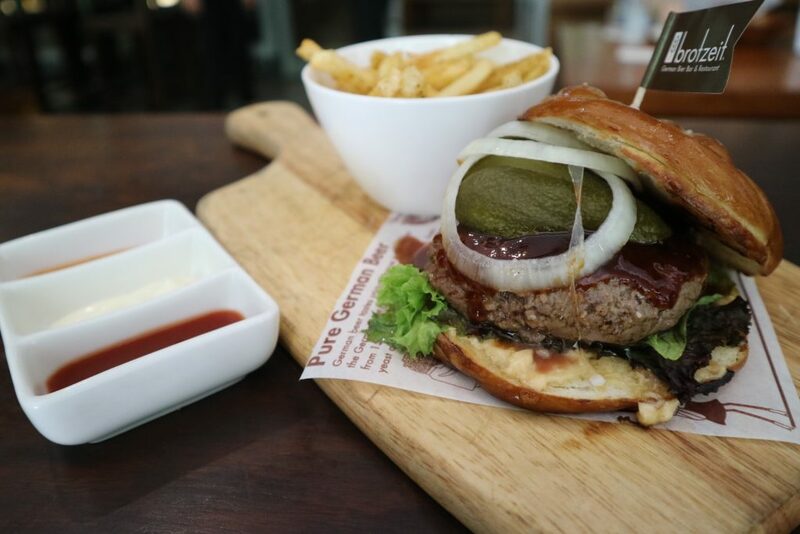 The popular Brotzeit burger is also available. 1/2 lb of meat baby! 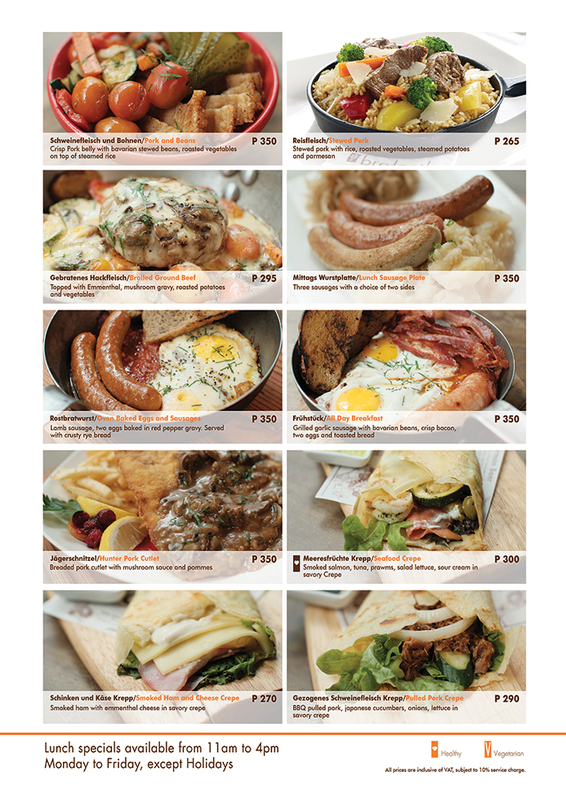 Yes, trying all these 19 dishes from Brotzeit took me 6 hours. Thank goodness this menu is available from 11 am to 4pm in their Shang Fort and Shang Edsa branches, Mondays to Fridays except holidays. 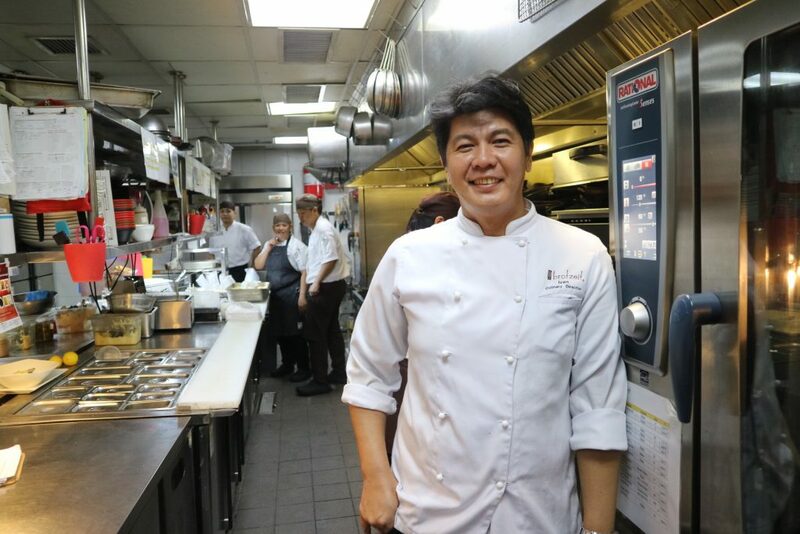 Thanks Brotzeit and to their culinary director Ivan Maminta.